The INTEMPCO LTX10 Sanitary series are highly reliable and microprocessor based RF level sensors designed to measure tank levels of conductive and non-conductive liquids in metal tanks. LTX10 sensors measure the change in capacitance that occurs as the tank level changes and outputs a standard loop-powered 4-20mA signal. After calibration any change in level is recognized and converted to an analog 4-20mA signal. LTX10 sensors use very high frequency and very low amplitude sensing circuitry to greatly minimize the effects of coating on the sensing probe. The LTX10 includes a standard 4-20 mA loop powered LTX transmitter housed in a rugged enclosure, a 1/2 inch diameter rigid probe for ranges up to 20 feet and a polished stainless Tri-Clamp. Probe material is SS316, supplied bare or PFA jacketed. The LTX10 is designed for tanks which have available Tri-Clamp connection. Other sanitary fittings are available. Consult factory. LTX10 can be used in many tough sanitary applications. This level sensor is shock resistant and very rugged. There are no moving parts. 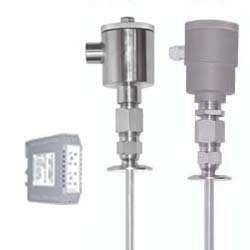 PFA jacketed probe can withstand temperatures of up to 200°C and pressures to 500 psi. The stainless steel enclosure is very rugged and NEMA 4X rated. Caustic washdown is not a problem. Optional, remote mounted DIN Rail transmitter is available, which can be connected to the level sensor via a 3- conductor cable up to 1000 ft (300m) long. The calibration is accomplished via four push buttons, located on the transmitter.